NEWPORT, OR., July 16, 2008 – Rogue Ales Brewery and Eugene City Brewery won 4 of the 11 Best in Class awards and the title of Supreme Champion for Rogue’s Imperial India Pale Ale at the New Zealand International Beer Competition. Rogue Ales’ Saint Rogue Dry Hopped Red won a silver medal and was 1st in Class in the Amber category. Hazelnut Brown Nectar and Imperial India Pale Ale both won gold medals and were 1st in Class in the English Brown Ale and Imperial categories respectively. Eugene City Breweries’ Track Town Triple Jump won a silver medal and was 1st in Class in the Pale Ale category. 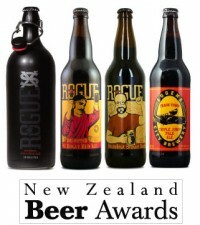 The New Zealand International Beer Awards is an annual competition held each year in Nelson, New Zealand. Medals awarded are determined on fidelity to style, brewing excellence, and overall product quality. Each beer is judged in a blind tasting fashion by a panel of international beer experts. Hazelnut Brown Nectar is a nutty twist to a traditional European Brown Ale made from 13 ingredients: Harrington, Klages, Munich, Hugh Baird Brown, Carastan 13-17, Crystal 70-80, Crystal 135-165 & Beeston Chocolate Malts; Perle and Sterling Hops; Rogue’s Proprietary Pacman Ale Yeast & Free Range Coastal Water. Dark brown in color with a hazelnut aroma, a rich nutty flavor and a smooth malty finish. Hazelnut Brown Nectar measures 12º PLATO, 28 IBU, 75 AA, 9.8º L.
Imperial India Pale Ale (I2PA) is made from 6 ingredients: Two-row Pipkin Pale Malts; Saaz, Cascade & Northwest Golding Hops; Rogue’s Proprietary Pacman Ale Yeast & Free Range Coastal Water. Above and beyong an India Pale Ale-Imperial India Pale Ale is radically hopped with an intense aroma and hop bitterness. I2PA measures 20º PLATO, 74 IBU, 75 AA, 13º L.
St. Rogue Red is created from 10 Ingredients: Great Western Harrington, Klages, Munich & Hugh Baird Carastan 30-37 & 13-17, Crystal 70-80 Malts; Chinook & Centennial Hops; Rogue’s Proprietary Pacman Ale Yeast & Free Range Coastal Water. Reddish copper in color, a roasty malty flavor, with a hoppy-spruce finish. St. Rogue Red measures 13º PLATO, 44 IBU, 73 AA, 27º L.
Triple Jump is created from 8 Ingredients: Northwest Pale, Munich and Crystal Malts; Horizon, Amarillo and Crystal Hops; Pacman Ale Yeast and Free Range Coastal Water. A Northwest style Pale Ale. Light copper in color. A refreshing Ale that focuses on Hop flavor, with a slight malt presence in the background. Triple Jump measures 13.5º Plato, 55 IBU, 75 AA, 8º Lovibond. Celebrating its second century, Rogue Ales is an Artisan Varietal Brewery founded in Oregon in 1988, as one of America’s first 50 microbreweries. Rogue has 550+ awards for taste and quality and is available nationally and in 10 countries. Eugene City Brewery is an Artisan Varietal Brewery founded in Oregon in 2004. Track Town Ales have 30 awards for taste and quality and is distributed in 14 states. Surprising? HELL NO!! Rogue is definately ONE of the kings of the west coast!! Now I want a Mocha Porter…DAAAMN YOU BEER GODS!! !